Enthusiastic about science and experiments, to the point where he will underestimate the risks to himself or others. When not 'sciencing it up,' he is generally laid back, willing to lend a hoof to friends at a moment's notice. Likes flying through the clouds. Dislikes being called a Mad Scientist. "I'm just pushing the envelope of pony knowledge, that's not being insane." Brown fur on the body, brown wings. White fur on the head, mane and tail. Yellow irises, yellow hooves, yellow mark on the muzzle. 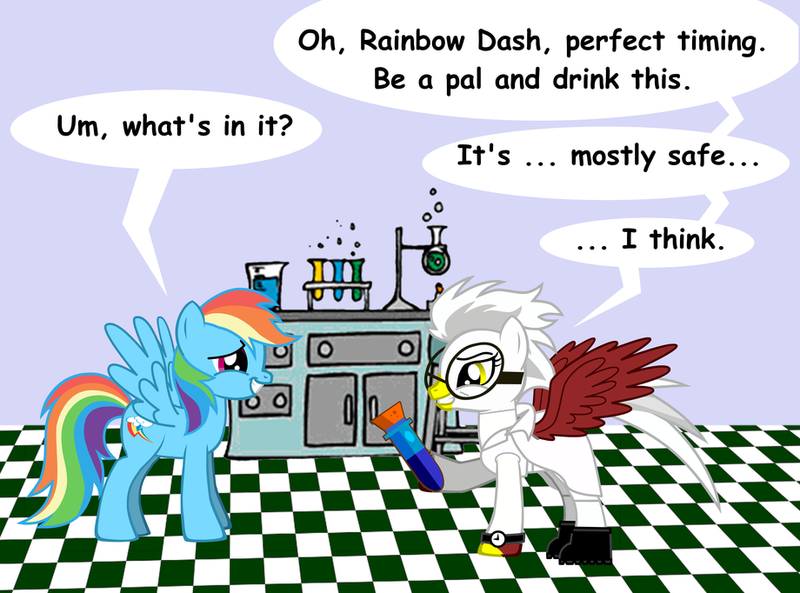 Cutie mark is a bubbling flask. Always wears Digital watch on left foreleg, black rubber boots on hindlegs, and large-framed glasses. When doing expriments, adds white lab coat to the mix. A quick scene showing off Donder's personality and his interactions with other ponies. Note there is no malice involved, only enthusiasm, and a general underestimation of possible risks to others. I'll make an adjustment later, the test tube was a piece of placeholder clip art while I sketch out a proper vial.